Welcome to Grapevine Physical Therapy & Sports Medicine's patient resource about Peroneal Tendon Subluxation. The peroneals are two muscles and their tendons that attach along the outer edge of the lower leg. The peroneal tendons are enclosed in a fibrous tunnel that runs behind the outside ankle bone (the lateral malleolus). Damage or injury to the structures that form and support this tunnel may lead to a condition in which the peroneal tendons snap out of place. This condition is called peroneal tendon subluxation. The primary muscles supporting the lateral (outer) part of the ankle are the peroneals. These two muscles and their tendons lie along the outside of the lower leg bone (fibula) and cross behind the lateral malleolus (the outside ankle bone). The tendons of the peroneal muscles pass together through a groove behind the lateral malleolus. The tendons are kept within the groove by a sheath that forms a tunnel around the tendons. The surface of this sheath is reinforced by a band of ligament called a retinaculum. 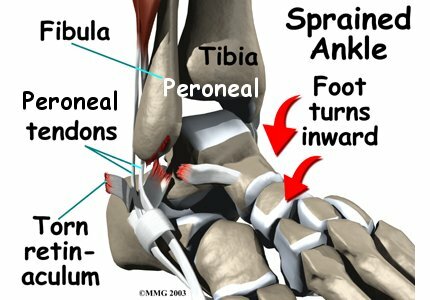 Contracting the peroneals makes the tendons glide in the groove like a pulley. 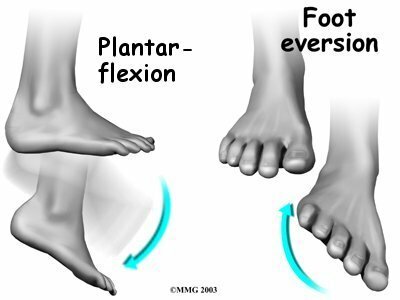 This pulley action points the foot downward (plantarflexion) and outward (eversion). Tendons attach muscles to bone. Tightening a muscle puts tension on the tendon, which can move bone. Many tendons in the body are held in place by supportive connective tissue, such as a ligament or retinaculum. 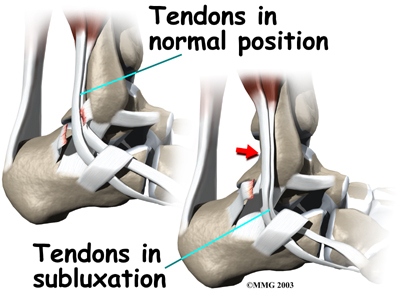 If the supportive tissue has been damaged or injured, the tendon may be free to slip out of its normal position. This is called subluxation. When the subluxed tendon slips back into place, this is called relocating. A tendon that forcefully snaps out of position and can't relocate has dislocated. 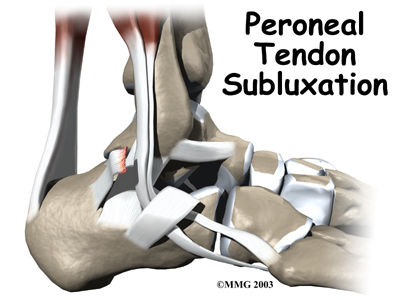 The main cause of peroneal tendon subluxation is an ankle sprain. 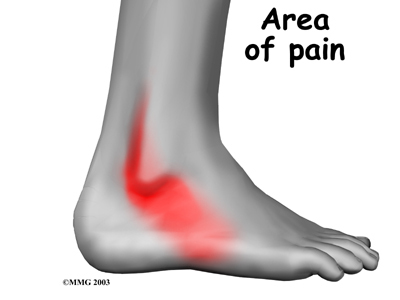 A sprain that injures the ligaments on the outer edge of the ankle can also damage the peroneal tendons. During the typical inversion ankle sprain, the foot rolls in. 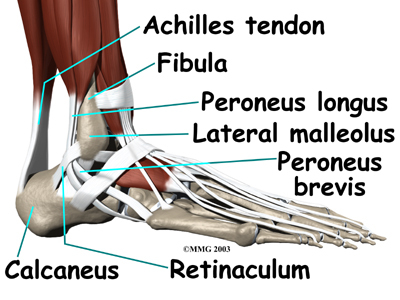 The forceful stretch on the peroneals can rip the retinaculum that keeps the peroneal tendons positioned in the groove. As a result, the tendons can jump out of the groove. The tendons usually relocate by snapping back into place. The injury to the retinaculum may be overlooked at first while treatment focuses on the injury to other ankle ligaments. This means the subluxation may begin much later, and it may not seem to be caused by the initial ankle sprain. If not corrected, this snapping of the tendons can become a chronic and recurring problem. An acute dislocation of the peroneal tendons is rare. It occasionally happens during sport activities that force the foot up and in, for example during skiing, ice skating, or soccer. At the moment the foot turns up and in, the peroneals violently contract to protect the ankle. This can cause the retinaculum to tear, allowing the tendons to slip out of the groove. Differences in the anatomy of the groove may predispose some people to peroneal tendon subluxations. The groove may be too shallow. Or the ridge that helps deepen this groove may be too small or even absent. Sometimes, the retinaculum that keeps the tendons in the groove may be too loose. In these cases, patients may not recall any injury to explain the persistent snapping of the peroneal tendons. What does peroneal tendon subluxation feel like? Patients describe a popping or snapping sensation on the outer edge of the ankle. The tendons may even be seen to slip out of place along the lower tip of the fibula. It is common to feel pain and tenderness along the tendons. There may also be swelling just behind the bottom edge of the fibula. Diagnosis of peroneal subluxation begins with an examination of the ankle. Your Physical Therapist at Grapevine Physical Therapy & Sports Medicine will move your ankle into different positions to see when the tendons snap out of place and if they relocate. One test involves holding pressure down on the ankle as you pull your foot up and out. Our Physical Therapist feels behind the fibula during this test to determine if the tendons are popping out of place. If your Physical Therapist in Grapevinesuspects a tear in the retinaculum, you may be referred for additional medical evaluation by a doctor. Nonsurgical treatment for peroneal tendon subluxations includes a program of rehabilitation exercises to help control symptoms. At Grapevine Physical Therapy & Sports Medicine, our Physical Therapists will create a specialized program to help you improve the strength and coordination of your ankle, and more quickly regain normal ankle function. When you visit Grapevine Physical Therapy & Sports Medicine, your initial treatments will be used to help control pain and swelling from the surgery. Our Physical Therapist may apply ice and electrical stimulation during your first few Physical Therapy sessions, as well as massage and other hands-on treatments to ease muscle spasm and pain. Our Physical Therapy is designed to help improve ankle range of motion without putting too much strain on the injured area. Typically, after about six weeks of treatment, our therapist will help you increase your activity level. Your Grapevine Physical Therapy & Sports Medicine Physical Therapist will slowly add exercises to improve the strength in your peroneal muscles and help you regain position sense in your ankle joint to improve its overall stability. Rehabilitation after surgery can be a slow process, but our professionals will custom design a Physical Therapy program to speed your recovery. Recovery and rehabilitation varies for each patient, but as a guideline, you may expect to attend our therapy sessions for two to three months, with full recovery typically requiring up to six months. At Grapevine Physical Therapy & Sports Medicine, our goal is to help manage your pain, improve your range of motion, and maximize strength and control in your ankle. When your recovery is well under way, regular visits to our office will end. We will continue to be a supportive resource, but you will be in charge of doing your exercises as part of an ongoing home program. Grapevine Physical Therapy & Sports Medicine provides Physical Therapy services in Grapevine. 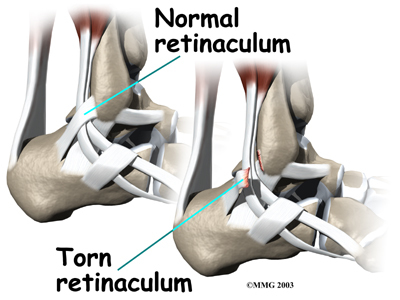 If your doctor suspects a tear in the retinaculum, X-rays may be taken to determine if the torn retinaculum has pulled off a piece of the fibula bone. This is called an avulsion fracture. X-rays are also used to look for other injuries to the ankle. Your doctor may also order a magnetic resonance imaging (MRI) scan of your ankle. MRI scans can show abnormal swelling and scar tissue or tears in the tendons. However, MRIs won't always show subluxation of the peroneal tendons. If your injury is acute, treatment without surgery may involve placing your ankle in a short-leg cast for four to six weeks. Your physician may also prescribe medications. Anti-inflammatories can help ease pain and swelling and get you back to activity sooner. These medications include common over-the-counter drugs such as ibuprofen. The goals are to allow the torn retinaculum to heal and to prevent chronic subluxation. Your doctor may advise you to begin Physical Therapy once the cast is removed. Many patients with peroneal tendon subluxation will eventually require surgery, especially when symptoms have not been controlled with nonsurgical measures. The following are different surgical procedures designed to help the peroneal tendons remain in their proper position. 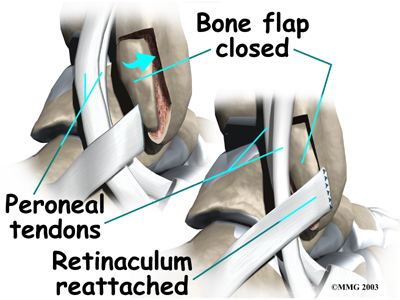 Retinaculum repair is gaining popularity. This procedure restores the normal anatomy of the retinaculum that covers and reinforces the tendon sheath around the peroneal tendons. 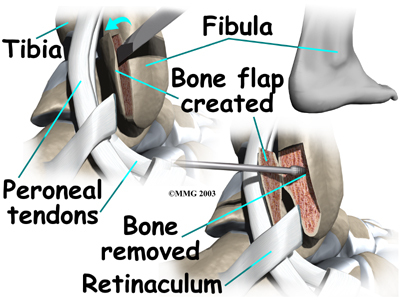 In surgery to repair the retinaculum, the surgeon first makes an incision along the back and lower edge of the fibula bone. This lets the surgeon see the spot where the retinaculum is torn. The surgeon uses a burr to create a trough along the fibula bone next to the original attachment of the retinaculum. The torn edge of the retinaculum is then pulled into the trough and sutured in place. The skin is closed with stitches. Groove reconstruction is done to deepen the groove so the peroneals stay in place behind the bottom tip of the fibula. 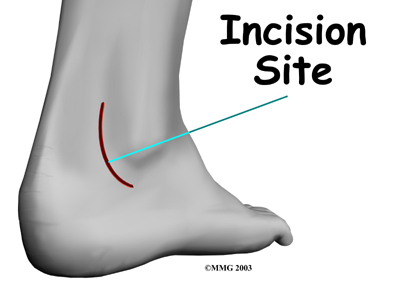 In this procedure, the surgeon first makes an incision along the back and lower edge of the fibula bone. The surgeon cuts a small flap in the bone near the bottom corner of the fibula. The surgeon then carefully folds the flap back, like a hinge. With the hinge held open, the doctor scoops out a small amount of bone under the flap to deepen the groove. The surgeon closes the flap on its hinge and tamps it in place. A screw may be used to hold the flap down. Next, the tendons are returned to their location behind the tip of the fibula. 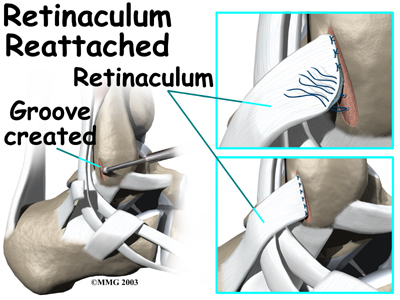 Repair of the retinaculum may also be required with this procedure (see above). The skin is closed and sutured. 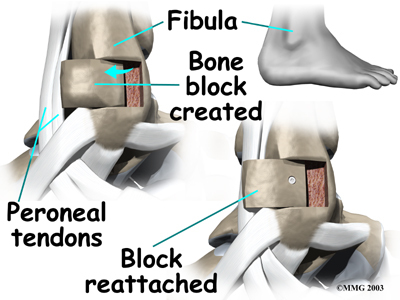 The purpose of a bony block is to form a barrier that keeps the tendons from slipping out of place. The block is usually formed with bone taken from the lower end of the fibula bone. To create a bony block, the surgeon opens the skin along the lower edge of the fibula. The surgeon then measures a small area on the back of the fibula, near the lower tip of the bone. A special tool is used to cut this small section of the fibula. The cut only goes partway through the bone. The surgeon slides the small block of bone backward, out of its original spot. The bone may be rotated slightly to create a solid barrier that will help keep the tendons from sliding around the lower edge of the fibula. A screw is inserted through the small block of bone into the fibula. The screw keeps the bony block in its new location until it heals. The surgeon checks the fit to make sure the tendons can glide behind the new block of bone without slipping out of place. The skin is then closed and sutured.